Step into The Nostalgia Box to see the history of home video game consoles and play some classic games. The collection includes the first video console made for home use, the Magnavox Odyssey from 1972, and subsequent early consoles from Atari and Nintendo, in addition to newer models such as the PlayStation 3 and Xbox 360. 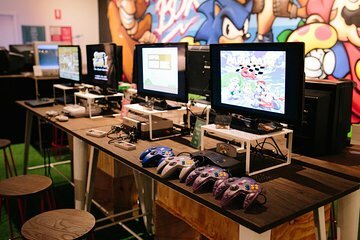 You can play retro games including Super Mario Brothers, Space Invaders, Donkey Kong and Crash Bandicoot. Fun for all ages, whether you are reliving your youth or introducing the kids to the games.